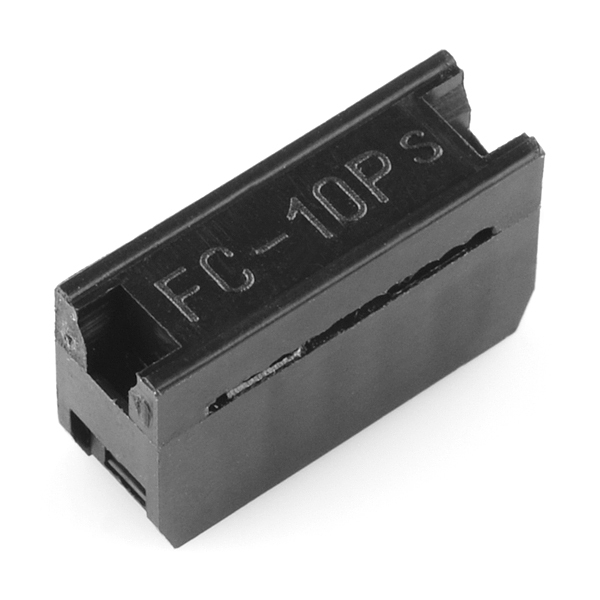 These 2x5 crimp connectors can be snapped onto 10-wire ribbon cable to make your own cable assemblies and keep your connections organized. 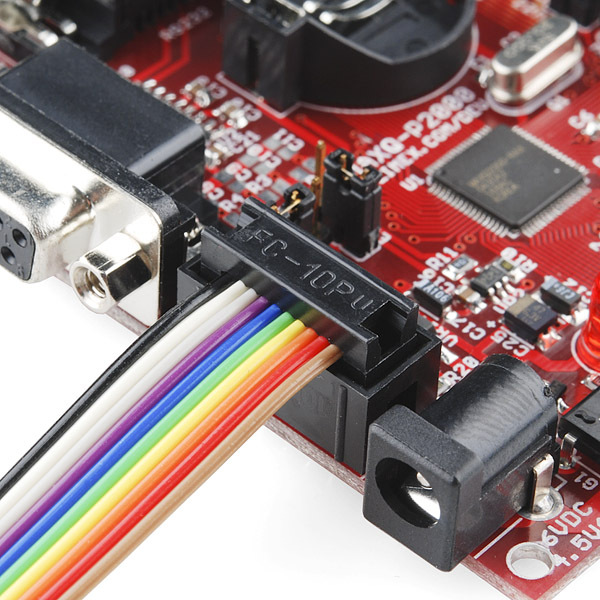 Simply press the connector onto your ribbon cable, no soldering required, which makes it easy to add as many mid-cable connectors as you need. I have found that all of these connectors have connectivity problems. I have used the sparkfun wire, and also other wire, and when I eliminate this connector from the equation, the problem goes away. It tests fine with a meter, but when I want to use it with a device, odd things happen which I cannot explain. I remove it an all is fine. These normally have a retaining clip that keep the two parts of the connector closed. This didn't come with one. Do you have to buy the 2x5 ribbon cable to go with this or the connector will like convert the normal 10 wire into a 2x5? 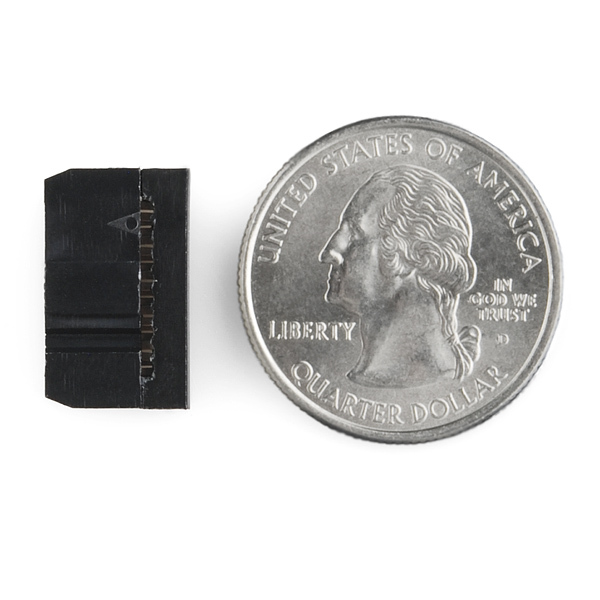 The connector attaches to a normal 10-wire ribbon cable; the wires will end up alternating between the two rows of pins. A few comments mentioned that it was hard to crimp. I just took my shot and it crimped down like a charm with a large set of pliers. Great product!!! Anyone have any problems using this on non-ribbon wires? I can't find how these pins are set up. When I plug it into the male header in a PCB board, I need to know that the pins are correct. I know that pins are offset when attaching the cable, but I don't know in what way. In other words, my pin connection could look like either of the following. Thank you very much! That is exactly what I needed. I will appreciate any and all help! thanks! whatever you do dont bother with a pair of channel lock pliers. did not work. i went easy and still broke 2 of them. I gotta echo the above sentiments. I've just broken two of these connectors. Any chance you folks could offer these, pre-made? With the "breadboard-friendly-end"? Is there some special tool or technique for attaching these to ribboncable. I thought I could press down with a small screwdriver and ended up bending the pins! You could also put it in a breadboard so the pins are protected, and squeeze it through the breadboard. I've seen people use pliers, but I always worry about breaking them if they're not squeezed together straight. How do you other customers assemble these? I've had good luck with a pair of lock-jaw pliers. Just set the pliers for slightly larger than it will be when crimped, line everything up, and squeeze. found a way to do it - use a vise. You have to carefully line up the pins with the corresponding wires. The first time I tried I shorted out some of the pins. It seems to take a lot of pressure to pressed through the cable. I wasn't using sparkfun cable, so I don't known if that is the problem. I saw a youtube video that showed the process, but he barely used any pressure. His connector was a three piece kind. yes, I've done this with the ones pololu sells, I just used a chair, piece of wood and body weight... worked fine, but again those were 3 piece connectors. I'm not exactly familiar with cable terminology, but doesn't 2x5 mean that there are two rows of 5 pins? The pictures look like it is one row of 10 on both sides of the connector. Is the connector really 2x5? It will be 2 rows of 5 connectors. When you place the 10 conductor ribbon cable in to crimp it, you'll notice that every other insulation piercing pin is slightly offset. This is to connect to one of the two rows of pin sockets.